At an orphanage just outside Freetown in Sierra Leone, the Archbishop of Canterbury looks totally at ease as he not only watches, smiling, but takes part as the children sing to greet him. Most of them have lost parents to Ebola. Some, though, have survived the virus, but cannot return to their homes because other villagers still fear they might infect others. 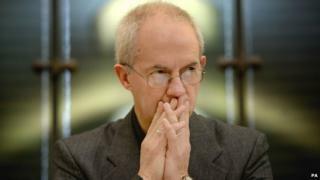 It is a brief trip, but there is just enough time for Archbishop Justin Welby to offer a heartfelt prayer to the congregation at St George's Cathedral in Freetown where his visit is warmly welcomed as a sign that the suffering of the people of Sierra Leone - and the over 2,000 who have died of Ebola there - is not forgotten. "Pray for them," he says, as he and his small close-knit team fly back home. He has cut through Lambeth Palace bureaucracy to ensure he has the people he needs to turn his vision into reality. "And give to the charities that support them." The archbishop returned to the UK just in time to see the fruits of his earlier work: the nomination of the first woman bishop in the Church of England, the Reverend Libby Lane, as the Bishop of Stockport. It was a fitting end to a year in which the former oil executive demonstrated his very practical and energetic leadership style for a church that has long been divided on many levels. He had persuaded those for and against women bishops to come together to confront their differences with dialogue and to learn to "disagree well", leading at last to a vote that amended canon law to allow a bishop to be a man "or a woman", the three small words that brought decades of debate to a conclusion. At once very much a man of God yet also a man of the world, the archbishop manages to combine both to put his evangelical faith into action, using his experience of business to push forward issues ranging from ethics in the City to payday lenders and poverty in the UK. He has formed around him a team of expert advisers and cut through Lambeth Palace bureaucracy to ensure he has the people he needs to turn his vision into reality. "It's a style of leadership nurtured in the business world. He doesn't mess around, and he has a very clear vision of where he wants to go," says Ruth Gledhill, contributing editor to Christian Today. "His leadership has meant that you can feel a brightening and lifting of the atmosphere in church - and you think 'maybe we have got a future'. "It's now a Church that's confident in itself for the first time in a long time. "And it has also been incredible to watch. He gets away with talking about Jesus in a world that's so secular, and people listen. "He's like a rocket that's been put under the Church." The archbishop has also managed to change the headlines on the Church of England from a narrative of decline and discord to glowing coverage of an institution whose leadership is deeply engaged with trying to solve the social problems that affect families in the wider world. He turned around the potentially bad news that the Church of England had an indirect stake in Wonga, the payday lender, with a frank admission of embarrassment, a pledge to disinvest and a campaign to help credit unions stop people getting into hopeless debt with payday lenders. That triggered a national debate on the practices of those lenders, and helped lead to reforms such as a cap on extortionate interest rates. He has also shone a spotlight on why so many in a wealthy country, which spends much of its budget on welfare, are now resorting to food banks. He warned that hunger "stalks large parts" of Britain, after the all-party parliamentary group report that he funded to examine the causes of and solutions for food poverty in Britain reported back. Even the archbishop's announcement of the creation of St Anselm's Community was highlighted prominently in the Financial Times, which clearly likes a religious leader who speaks the Pink Un's language as well as that of the Bible. In the FT, he outlined his call for future leaders in the City to take part in the year-long programme of prayer, study and service with the poor. They might sometimes find it "uncomfortable, demanding, rigorous and tiring", he said, but he promised it would also be fun. "At the heart of Christian faith is a sense of enormous joy and of recognition of one's place and call, one's vocation, one's purpose, one's value." On St Anselm's website, the Archbishop said Jesus Christ gives the perfect example of how companies should set their aspirations on long-term human flourishing, rather than simply short-term financial gain. Jesus Christ was "relatively unsuccessful in pure output terms," as he put it. "He had 12 main followers, one betrayed him, 11 ran away. "If you think of that in terms of a board of directors, it's not invariably successful. "But in the next 300 years those followers so transformed the world that the greatest world power of the age was changed. Now that's what we call output." While he takes his position extremely seriously, the archbishop also possesses a sometimes impish sense of humour. This was heard on his first choice of music on Radio 4's Desert Island Discs on Sunday: 'The Lion Sleeps Tonight' - because it was the song he would sing to distract anyone else in his family from winning at the card-game Racing Demon. It is a quality he will need in spades over the coming years. For a major battle is now looming for the soul of the Church in England and the wider Anglican Communion over its position on homosexuality. Over the past year, the archbishop has travelled over 149,000 miles visiting the Anglican and Episcopal family of member Churches or 'provinces', demonstrating the importance he places on personal relationships. He has also already made two visits to the Vatican, to another reforming religious leader who has also spoken out against poverty and the scourge of modern slavery. However, the archbishop's key aims of "mutual flourishing" and "learning to live with difference" may prove harder to square with a communion that in some parts of Africa has agreed with harsh anti-gay laws, while elsewhere, in the US, has seen the appointment of both a gay and and a lesbian bishop. The Church of England is having "shared conversations" on sexuality, but those will be hard to translate to some parts of the Communion. That was a subject he touched on, but refused to pre-judge in Desert Island Discs on Sunday. "The reality is that when I listen to people I know that I'm listening to people for whom not just the issue of sexuality but the whole way in which the church lives and exists and reaches out to people, what it looks like to be a holy church, is something on which they feel passionately and are deeply, deeply, deeply disagreeing. "And if you love them you listen carefully, and in obedience to the work of the spirit of Christ, we have to seek to love one another." Outside the church, this plain-speaking Archbishop has been hailed by many as that rare thing in this secular age: a moral compass at a time of great technological and social change, when trust in politicians and post-war institutions has diminished, but not the need for ethical leadership in a materialistic and uncertain age. He has also won over his interlocutors on interfaith matters during his almost two years in office, according to Rabbi Laura Janner-Klausner, Senior Rabbi to the Movement for Reform Judaism. He takes the world and his role extremely seriously, but not himself in it - he has no pomposity at all. "He's a pleasure to have as a colleague, and has beautiful intra-faith relationships with the Catholic church, and with interfaith leaders in Britain. "He is so fantastically practically-minded that you can have great discussions on how to solve certain issues, and he wants to use every millisecond." She terms him: "Super-astute: a problem solver, and a listener. He also has a very religious irreverence, which is a brilliant thing. "He takes the world and his role extremely seriously, but not himself in it - he has no pomposity at all." The rabbi recalls someone asking her to take a photo of the Archbishop at an investiture they both attended, pointing at a bishop resplendent in episcopal purple. She had to tell him that the archbishop was in fact the man sitting to one side, wearing an ordinary shirt and trousers, and keeping out of the spotlight. That, too, may prove harder in the coming year.